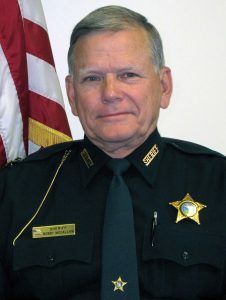 Sheriff Bobby McCallum was elected to the Board of Managers by the general membership to fill the seat of the late David Hobbs, former Sheriff of Jefferson County who tragically lost his battle with cancer last year. We are grateful for Sheriff McCallum’s willingness to serve and look forward to his assistance in providing the best possible service to the 59 sheriffs’ offices that participate in Fund programs. We invite you to learn a little more about Sheriff McCallum and the talents and experience he brings to the Board of Managers. Growing up, I had several mentors and good friends in law enforcement. Friends of our family were a state trooper and a deputy sheriff here in Levy County, and that drew an interest in it for me. Actually, I wanted to be a coach and teacher, but I ended up getting a degree in criminal justice and got a job in the sheriff’s office as a dispatcher and a jailer. That was almost 50 years ago. How does serving on the Board connect with your work experiences? I actually worked in insurance with Florida Farm Bureau as a district claims adjuster, then as district underwriting manager. I also spent some time with the state attorney’s office and eventually as executive director for the eighth circuit. But my heart was always with the sheriff’s office. I was asked to come back to the Levy County Sheriff’s Office to run the law enforcement bureau division and the jail administration, which I was happy to do. Over the years, I worked for four different sheriffs – and for three of the four sheriffs I was the chief deputy or an equivalent. I got a lot of good experience from that. What is the best part about being sheriff? The greatest thing is serving the people. We’ve had a lot of support from the county, and I’ve got a really good group of men and women here now in all aspects of the operation. I think just being able to serve and help people in their time of need, still being compassionate while keeping our guard up and doing our job to make people feel safe. Treat people like you’d want to be treated in any situation. Put yourself in their position when you can and make sure you treat them like you’d want to be treated in that same situation. Why were you interested in serving on the FSRMF Board? First is the fact that we participate in all of the Fund programs here in the sheriff’s office. It’s important to us. And because of my past experience with insurance, I understand part of it — the manager aspects, the safety aspects, the good policy procedures and the safety teams on board. I have a basic understanding of the indemnity and claims aspects of insurance and believe that will help me serve my fellow Sheriffs that are members of the fund. Why is the Fund important? The Fund insures our risk and it helps us manage the risk in our service to our citizens. It’s important because it affects the tax dollars of our citizens and what we’re paying for the coverages we need. We have the best thing going and that can be attributed to the great leadership at the Fund and the outstanding staff. I think the overall scope of what we’re trying to accomplish is protecting all of our people and our taxpayers’ dollars. I’m very active in my church, and I love sports. My kids are grown and my grandkids are about grown, but I do have a couple that I get to enjoy watching their t-ball and softball. I enjoy my family and still try to protect that time with my wife and grandkids.